We love them, we love them not . . . no, we really do love them! Daisies are the classic wildflower, just begging to be added to a kitchen counter vase or woven into a flower crown. True daisies are not the only option for that beautiful shape, though. Plenty of plants have daisy-like flowers while bringing other benefits for growing methods, season, and various benefits. 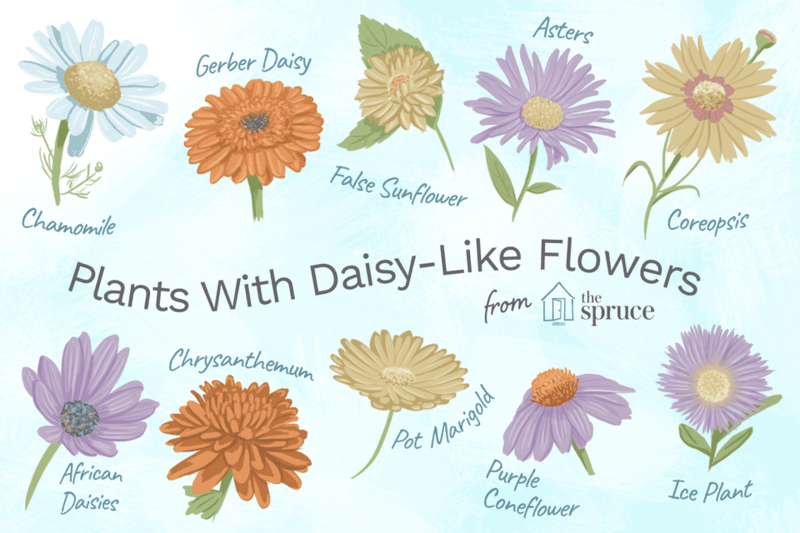 Take a look at a collection of plants with daisy-like flowers. The variety of colors you can get with gerbera daisies are nearly limitless. Gerberas prefer full sun spaces with loose soil that drains well. Enjoy summertime daisy-like blooms as a border or an indoor potted plant, perennial in southern zones and annual elsewhere. These plants are hardy to zones 8 through 10. Beloved as a calming herbal tea, chamomile also sports tiny daisy-like flowers on spindly stems. Sow in the fall for blooms coming up in the spring. Chamomile is an easy plant to grow in full sun with little to no maintenance (so much so that it can become an invasive plant sometimes considered a weed)! We know better, though, and enjoy chamomile for its beauty and functionality. It is hardy to zones 3 through 9. Yellow, full blooms with daisy shapes cover the heliopsis plant, also known as the false sunflower. These do well in the South, tolerate heavy heat, and thrive in full sun. These plants are hardy to zones 3 through 9. Excellent as a companion plant, calendula is edible, medicinal, and helps with natural pest control. Colorful, full flower heads have a daisy-like shape with full, almost bushy petals. For an extra-long blooming time, be sure to deadhead them after spring flowering. These plants are hardy to zones 8 through 11. A wide range of asters is available, covering a spectrum of colors and huge jumps in height. Go for the tallest (up to eight feet) for the back of the garden or eight-inch varieties for the borders. Plan on late-season blooms from asters, balancing out a garden of early blooming flowers. Asters are hardy in zones 3 through 8. Also known as African daisies, osteospermums are shaped like daisies with stunning metallic centers. Plant near strong foliage to let the bright colors stand out on their own. These plants enjoy fertilizer, sufficient water, and acidic soil. It grows in zones 9 through 11. A low-maintenance perennial, echinacea (also known as coneflower) sports purple daisy-like flowers. Not only is it beautiful, but it can be grown for medicinal properties and is excellent in tea. It is hardy in zones 3 through 8. Another with a wide range of colors, coreopsis perennials could fill a container or section of the garden all on its own. Blends of reds, yellows, whites, and purples with the daisy shape provide a gorgeous range of visual interest. These flowers attract lots of bees and butterflies every season. These plants are hardy in zones 5 through 9. Somewhere between a daisy and a black-eyed Susan, rudbeckias have yellow flowers and dark centers. Enjoy planted in large groups for a mass of summer blooms. Full sun is best, as they are summer blooming, drought-tolerant, sun-loving perennials. These plants are hardy in zones 4 through 10. Thanks to their thick covering of blooms, gaillardia are also known as blanket flowers. 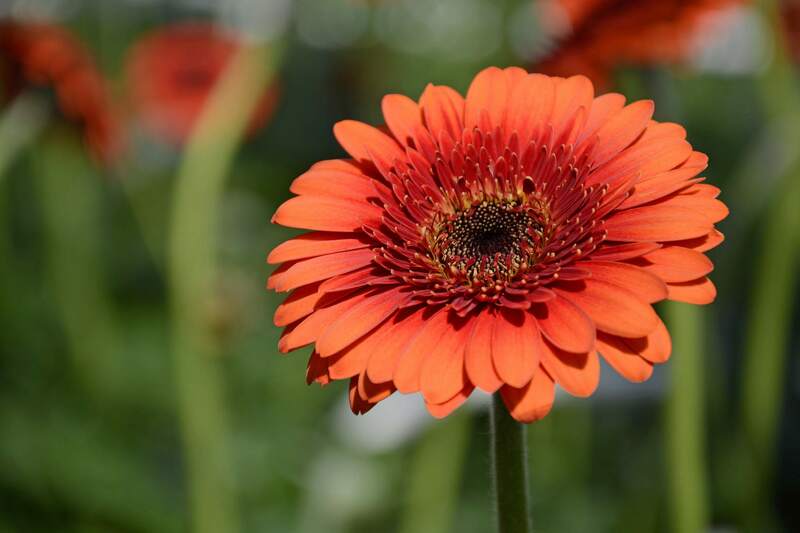 Its blooms are daisy-shaped with a wide range of colors from reds to peaches to orange and yellow, solid or blended. Gaillardias are low maintenance in well-drained areas in full sun. Gaillardias are hardy in zones 3 through 9. Striking purple daisy-like flowers with yellow centers cover the delosperma, otherwise known as the ice plant. Its gorgeous array does come at a price, though; you have to tend it carefully to keep it from over-producing. The right combination of drainage and moisture, as well as nutrient-rich soil without over fertilization in a full-sun area, will yield breathtaking results. It is hardy to zones 5 through 9. Cushion mums can be officially named Deandranthema or Chrysanthemum but either refers to the colorful, bushy, daisy-like perennials that can also double as annuals if you would prefer. Plenty of sunshine and moisture makes a thriving cushion mum. Use mulch to retain moisture and protect shallow roots. These plants are hardy in zones 5 through 9. Possibly the most similar to common daisies, the Shasta daisy grows in clusters of several feet tall and one to two feet wide with large, gorgeous blooms. In full sun, they will come back to you each spring and stick around all season long. These plants are hardy to zones 5 through 8.